A lower energy bill can be one of the many reasons to celebrate this holiday season. Take Care of Texas offers the following tips to help you not only reduce lighting and heating costs, but also give you that warm feeling knowing you’re doing something good for the environment. Reduce your holiday lighting costs. Use LED lights to reduce the cost of decorating your home for the winter holidays. LEDs are cooler, more durable, last longer, and they’re easier to install. The estimated electricity cost to light a six-foot tree for 12 hours a day for 40 days using LED mini-lights is about 82 cents! Turn down your thermostat. When you’re asleep or out of the house, turn your thermostat back 10 to 15 degrees for eight hours and save around 10 percent on your heating bills. Use the sun’s heat. Open curtains on south-facing windows during the day allowing sunlight to heat your home. Close them at night to reduce the chill you may feel from cold windows. Change your HVAC filter regularly, especially during the heavy-use winter months. A dirty filter slows airflow, making the system work harder, which wastes energy. Replace it at least every three months. Limit using your wood-burning fireplace. It provides ambiance, but it’s inefficient. Fireplace drafts can pull warm air up the chimney, robbing warmth from other rooms. Be sure to keep the damper closed unless a fire is burning. Weatherize your home. Caulk around windows, doors, and pipes to seal air gaps and add weather stripping to doors and windows. This can save you up to 10 percent on your heating bills. Also, check to make sure your attic is insulated properly. Most homes do not have enough insulation. 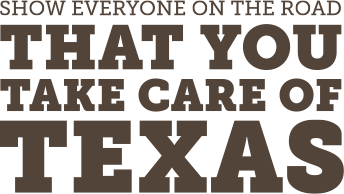 To learn more, visit TakeCareOfTexas.org. Pledge to do your part, and we’ll mail you a Texas State Parks: Official Guide.